Charles Manson turned 75 this week in a California state prison. He spends most of his time playing guitar. Corcoran, California (CNN) -- At 75, Charles Manson has spent more than half his life in prison for masterminding the notorious Helter Skelter killing spree that left actress Sharon Tate and six others dead in Los Angeles during the summer of 1969. Manson spent his 75th birthday this week at the state prison in Corcoran, California, where he is in the protective housing unit. Some records indicate that Manson was born on November 12, but Manson's current associates and other records indicate his birthday was on Wednesday, November 11. "He spent the day the same way he spends every day in prison," said Terry Thornton, spokeswoman for the state department of corrections. "Lately, the prison has told me, he doesn't come out of his cell very often." She added that Manson didn't mention his birthday to anyone, and only emerged from his cell for about 20 minutes on Wednesday. While his appearance has changed significantly from the wide-eyed cult leader who appeared on the cover of Life magazine in 1969, Manson continues to wield influence over some who consider him a wizened messenger. Prison officials say Manson still gets lots of mail and spends most of his days singing and playing guitar in a high security unit. He also spends time speaking to associates like "Gray Wolf," 60, and "Star," a 24-year-old fast food employee. 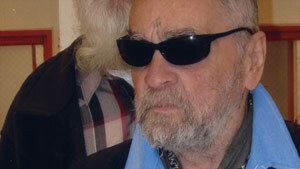 Wolf said Manson gave him his name -- just as he named members of his infamous "Family" of followers during the 1960s. Wolf said he moved close to the prison in Corcoran so he could be near the man he believes possesses deep insight into environmental issues. "Manson thinks the destruction of the environment is much more serious than we are being made out to believe," Wolf told CNN. "Our government keeps covering up problems with pollution, with coal, with automobiles. Charlie says we need to get back to the horse." Vincent Bugliosi, the man who prosecuted Manson and sent him to prison for life, is not surprised that Manson continues to hold sway over some people. "This is just a microcosm of the tremendous interest and fascination that people still have with Charles Manson," Bugliosi said. "The Manson Family no longer exists. There's no group calling itself the Manson Family on the outside. And these people -- I wouldn't say they're followers of Manson, that's too strong a word --they're supporters." Their names and words sound similar to those of Manson's past followers. Gray believes Manson's time in prison has given him a unique perspective on the environment. "You can characterize prison as an ashram or a retreat where you have all this time to be by yourself and think and so he's had time to turn these issues over and over in his head," Gray said. "A legend has been made about Charlie Manson and there's a media image that people make money off of every day, but it has nothing to do with Charlie personally. He is a personable person," he added. Star also got her name from Manson, and moved from Illinois to be closer to him. "He's really witty and really sharp and he's got a lot of good humor," she said. "He's got a weird sense of humor but I like it, it fits with me." He's really witty and really sharp and he's got a lot of good humor. The conversations range from small talk about life in prison to issues related to ATWA -- an acronym for Air, Trees, Water, Animals -- the ecological philosophy espoused by Manson and his followers, according to Wolf. What's really criminal, they say, is the way the environment is being poisoned. "Crime is anything that's done against your survival. Any sin against your life is crime. The problem is the atmosphere is dying, anything that sins against the air is a sin against your life, anybody that sins against the air should be considered a criminal and any sin against the air should be considered a crime," Manson said in a recorded phone conversation. "They had some bad rains and floods and a lot of people in trouble over there, so we're sending them packages to help take care of them. They are half Muslim and half Christians so we have to hold a balance," he said in a recorded conversation. "The way we live is freedom of religion so we don't want [any] war against people. We want a war against pollution. A war against people isn't going to help anyone, a war against pollution will help everyone." Star says she was drawn to the man she described as a "monk in a monastery" by his environmental views. "There's a lot of people all around the world that would say they support Charles Manson and his vision of ATWA," she said. "The goal, really, the main goal is to basically save life on the planet Earth from the humans," she said. "We have a key to make this goal accomplished, and that key is Charlie Manson." But Bugliosi says there's a darker attraction to Manson that reaches beyond the green movement. "There's a certain mystique that has developed around Manson," he said. "And one reason is that the very name Manson has come to be a metaphor for evil. He's come to represent the dark and malignant side of humanity, for whatever reason, people are fascinated by pure, unalloyed evil." CNN's Emanuella Grinberg and Ann O'Neill contributed to this story.